Avoid gum disease & have much better looking teeth! STRESSED OUT ABOUT GOING TO THE DENTIST? AVOIDING NECESSARY DENTAL PROCEDURES DUE TO FEAR? Dental-related stress is very EASY to control with hypnosis. and help you become a more calm, centered person in the dental chair. Hypnosis has the ability to relax and reassure those who are fearful of the dentist. Regular visits to the dentist are an important part of your overall health plan. Yet, some people are so afraid of the dentist it can turn a routine checkup into a nightmare filled with stress and anxiety. This can lead to more serious health problems and even more stress about a visit to the dentist. Through hypnosis, those with a fear of normal dental procedures can learn to overcome the fear and turn the anxiety into relaxation. Hypnosis specifically targets the part of the mind that holds on to irrational or unexplained fears. Rarely has anyone come away from the dentist with more than a little discomfort. The fears therefore, are usually unsubstantiated and therefore easily removed with hypnosis. Visualization is another part of the suggestive power of hypnosis. After becoming completely relaxed in the beginning stages of hypnosis, the listener is lead to visualize the situation of which they are fearful with them at the center of it. Then, reassuring and relaxing messages can be put in place of fears. The vision stays with the listener as they go from the imagined scenario to the reality of sitting in the dentist’s chair. Steve G. Jones is a clinical hypnotherapist who has developed a program just for those who fear the dentist. Overcome Fear of Dental Procedures Hypnosis MP3 audio uses hypnosis to first relax and then reassure those who are facing dental procedures with anxiety and fear. In just three weeks, a new prospective on the dentist can be had through hypnosis. Let this hypnosis MP3 change your life!!! as you listen to this Overcome Fear of Dental Procedures Hypnosis MP3 at night. It will allow you to un-wind and release the stress you associate with a trip to the dentist, and after three weeks of listening to it at night, you will be a much more CALM, RELAXED dental patient. Think about the many benefits!!! avoiding a much higher dental bill in the future!!! …just to name a few!!!! Steve G. Jones, Ed.D., Clinical Hypnotherapist, charges $1,500 for a custom recording and $25,000 for a one-hour private hypnotherapy session at his office. But you can get all the benefits for this low price. Simply listen to the Overcome Fear of Dental Procedures Hypnosis MP3 download every night as you go to bed for three weeks and feel the changes happening in your life. You will feel more empowered, more in touch with your true self, and you will truly know that your goals are within your reach. Steve G. Jones achieves AMAZING and LASTING results!!! Hypnosis is the easiest way to affect change in your life because the positive messages go straight to your subconscious mind effortlessly so you can accomplish your goals and reach for the stars!! All you have to do is listen to the Overcome Fear of Dental Procedures Hypnosis MP3 recording at night as you go to sleep!!! You’ll hear soft music, the gentle sounds of the beach, and the soothing sound of Steve G. Jones’ voice all working together to bring about positive changes in your life easily and naturally. Steve G. Jones has been helping people improve their lives with hypnosis for over 17 years…now it’s time for him to help YOU… don’t wait, do it NOW !!! you’ll be glad you did. See you at the top! Going to the dentist regularly is very important for your health. A dentist can prevent, diagnose, and treat many different diseases and disorders that could occur in your mouth. While at a routine appointment at the dentist, you will have your teeth cleaned. This is important to prevent gum disease, plaque, and other problems that could occur. You will also be examined by the dentist. Many people fear going to the dentist because they are scared of dental procedures. Dental procedures such as having a cavity filled, a root canal, or extraction can cause pain, but it is important to realize that not doing anything at all about problems in your mouth will eventually lead to pain as well. Nobody likes the sound of the dentist drill. However, dental procedures are necessary to fix problems that have occurred. I have read about many studies about patients using self-hypnosis before undergoing a dental procedures. These studies have shown that hypnosis relieves anxiety associated with the procedures and also reduces the perceived pain before and after a procedure. If you keep putting off going to the dentist, I encourage you to make an appointment now. You are becoming very comfortable with the idea of visiting the dentist. You realize that in the past visiting the dentist caused some anxiety, but now you find day by day that anxiety diminishing. You know that a dentist is a highly trained individual. You know that a dentist always has your best interest in mind. You know that you have chosen your dentist. You know that the dental procedures you will be seeing the dentist for are in your best interest. And so, keeping all these things in mind, a visit to the dentist is a very pleasant happening for you. You’re so relaxed as you now imagine yourself going to the dentist office. As you approach the dentist office, you become more and more relaxed because you know you are going to visit a professional, a state approved professional. You know that your dentist has all the proper qualifications to do the best job possible. As you imagine yourself now entering the dentist office, the smells of the office relax you more and more, because you know that these are the smells associated with dental hygiene, with proper oral care, with getting the treatments you need, with getting the treatments you deserve. And as you check in and sit in the waiting room, you are so very relaxed. Relaxing even more now, ten times more relaxed. And as you move towards the dental examining room for your consultation or your cleaning or your procedure, you are so relaxed, ten times more relaxed than you were even in the waiting room. So very relaxed, as you sit now comfortably in the dental chair realizing that this chair has been designed for your comfort and to allow the dentist to do the best job possible. And if there is a light overhead, this light relaxes you. Like the relaxing light coming from the sun on a warm sunny day at the beach. Relaxes you ten times more, you are so very relaxed and happy and completely at ease. You realize that any pain you may feel will be minimal. You realize that the dentist and anyone associated with the dentist, working in the office, will do their very best to make sure you have the most comfortable visit possible. And so any pain is so minimal and you realize that sometimes as part of the procedure there is some bleeding. This bleeding is so minimal. Your body is able to control the bleeding; it is just a normal part of the process and you are so relaxed. As you now lie there, relaxing, realizing that you are getting the care you need. The whole procedure goes by so easily, so quickly, you are surprised. You are surprised at how easy and effortless the visit was and now you imagine yourself getting out of the chair, a smile on your face. You realize you have done something good for yourself. A visit to the dentist is such a positive thing because you are taking care of yourself. You are putting trust in thoroughly trained healthcare professionals and this feels so good. You are so happy that you have access to proper healthcare and as you leave the dentist office, you’re so very happy, so very relaxed knowing that you did something for yourself. 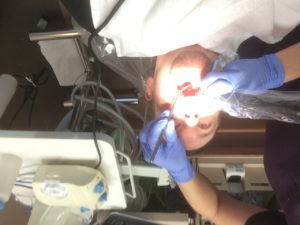 The Overcome Fear of Dental Procedures Hypnosis MP3 recording will help you get over your fear of going to the dentist! We all know, going to the dentist is not our favorite thing to do, but it is a necessary part of life. Going to the dentist promotes good dental health and even has an impact on our overall health, so it is a very important part of your life. The utensils and equipment they use is intimidating. They do not want to hear what is wrong with their teeth. They do not want to be criticized. It has been a long time since their last appointment. All of these are reasons that people fear going to the dentist. All of these reasons are addressed in the Overcome fear of Dental Procedures self-hypnosis recording. 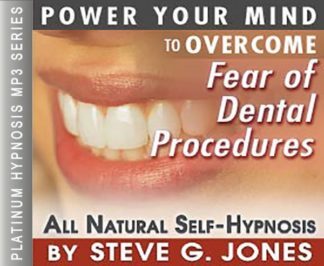 You can and will overcome your fear of dental procedures by listening to this powerful self-hypnosis session by Steve G. Jones. All you have to do is lay down, close your eyes, and press play and let the soothing affirmations of Steve G. Jones start working on your subconscious mind. You will be instructed to listen to the recording for 21 nights in a row before going to bed. You will be induced into a relaxed state and then your subconscious mind will hear positive suggestions putting your former fears to rest about dental procedures. This powerful hypnosis session will allow you to visually walk through an appointment with a dentist so that all of your fears will diminish and you can confidently go to the dentist. I challenge you to make an appointment now to see your dentist in one month. Order this powerful hypnotherapy recording, listen to it for three weeks, and you will be able to confidently go to the dentist!